Here's a recent article about freshman Marcel Puyat's expérience in his few weeks at Stanford. The article is written by mydesert.com, with the local connection that Marcel played his senior year at a high school in La Quinta, CA. Click on the image to enlarge the article. 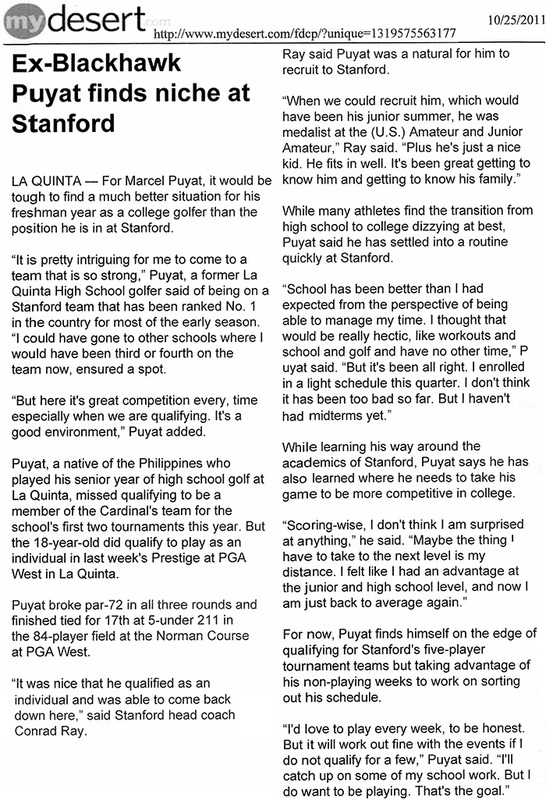 Meet the 2011-12 Stanford golf team freshmen in these three video interviews of Patrick Grimes, Patrick Rodgers and Marcel Puyat. The interviews were conducted at the Seibel Varsity Training Center late in September 2011 during their first week of classes at Stanford. Larger versions of these interviews can be found at their individual web pages : Patrick Grimes, Patrick Rodgers and Marcel Puyat.